Zoho Analytics allows you to easily create a stand alone Permanent URLs (Permalink) for all your reports and dashboards in a few clicks. These URL's can be made accessible with a secured login or a private permalink or with public access. Users visiting these links will be able to see the latest live version of the view. Permalink enables easy and quick access of the report/dashboard through bookmarking. What are the views for which I can generate a permanent URL? What are the access modes available when generating a URL for a report/dashboard? What are the differences between the three available access modes? How to generate a secured URL for a report/dashboard? How to generate a Private URL/permalink for a report/dashboard? Can I protect my Private URL (without Login) with a password? How to generate Public access URL for a view? What are the interaction options that are supported on a report/dashboard while accessing the URL? I regenerated the Private URL, now I cannot access my previously embedded views or URL's of that report/dashboard. What should I do? What are the permissions that can be granted while sharing the report/dashboard? How do I edit the permissions of the URL accessed? How do I remove the access of the URL? Can I pass a dynamic filter while generating the URL? 1. What are the views for which I can generate a permanent URL? You can generate individual permanent URL's for all types of views such as tables, charts, pivots, tabular view, summary view, query tables and dashboards that you create using Zoho Analytics. Refer to this question to learn about generating a URL. 2. What are the access modes available when generating a permalink/URL for a report/dashboard? The following are the three access models that you can choose while generating a URL for a report/dashboard. Secured Login (with login): This is the most secure mode. Only the users with whom you have shared the report will be able to view it upon logging into Zoho Analytics. Private permalink (without login): When this setting is selected Zoho Analytics will generate a URL which will contain a big randomly generated private key (private link), making them secure and very hard (if not impossible) to guess. Users can view the report without logging in to Zoho Analytics. This is available only in the Premium and Enterprise plans of Zoho Analytics. Public Access: In case you want all your users to view the report and do not require any random key based link generation or logging into Zoho Analytics, you can use this access mode. 3. What is the difference between the three available modes? Generating a URL with secured login allows the highest level of security to the view. 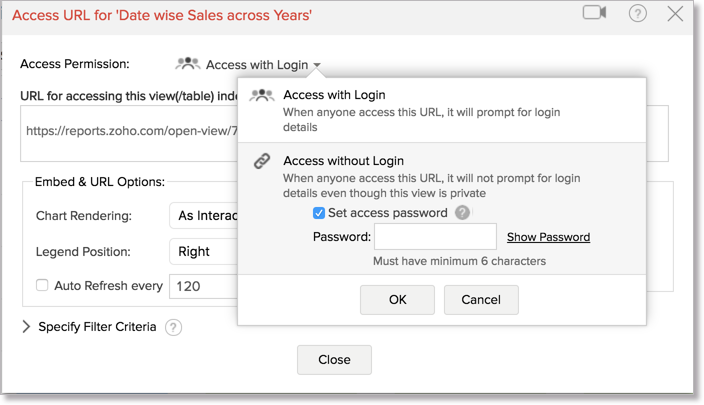 Selecting "Private Access with Login", would prompt the users to login to Zoho Analytics to access the view. Also, only users to whom you have shared the view would be able to access the view, on successful login. When selecting "Private Access without Login", Zoho Analytics will generate a private permalink/URL making it secure and very hard to guess. Users need not login to Zoho Analytics to view the report. Although this is secure, the randomly generated key is not impossible to guess. In case you want your report to be accessible to all the users and do not require any random key based link generation or logging into Zoho Analytics, you can use the public access mode. 4. How to generate a secured URL for a report/dashboard? 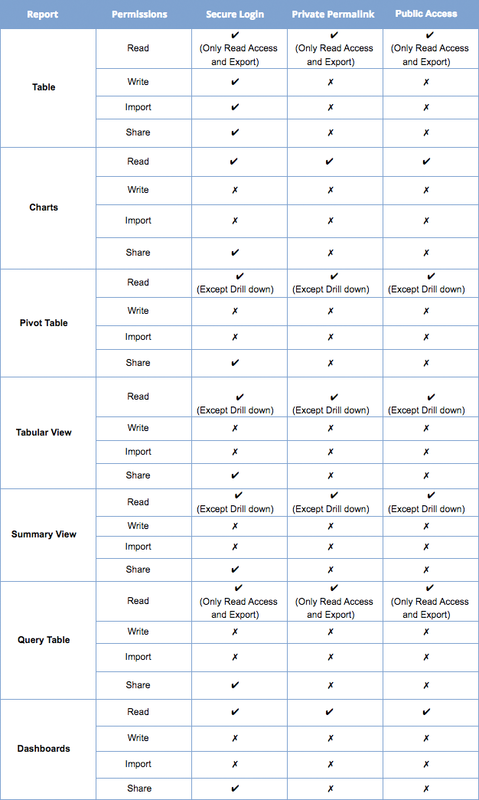 Click to learn about editing permissions. 5. How to generate a Private Permalink/URL for a report/dashboard? 6. Can I protect my Private URL (without Login) with a password? Yes, you can protect your private URLs (without Login)with password. When you generate a permalink with Private Access (Without Login) Zoho Analytics will generate a private permalink making it secure and very hard to guess. You can also protect it with a password by selecting Set access password checkbox in Access URL dialog. 7. How to generate a Public access permalink/URL for a report/dashboard? 8. What are the interaction options available? You can also generate URL's for reports to display it as a image. This feature is only available for charts. As a result of this, the chart will be generated as a static image and hence the URL will load faster. 9. I regenerated the Private URL, now I cannot access my previously embedded views or URL's of that report/dashboard. What should I do? When you reset/regenerate the URL, the previously shared URL's will become invalid. You will have to update the latest URL to continue accessing the report/dashboard. In case you have used the URL in the embed snippet that will become invalid as well. You will have to regenerate the new embed snippet and update the page. 10. What are the Permissions that can be granted while sharing the URL of a report/dashboard? 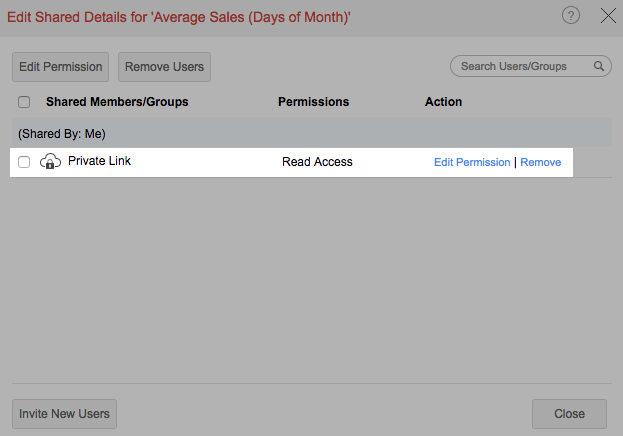 The following permissions can be granted while sharing the URL of a report/dashboard. 11. How do I edit the permission of the URL accessed? Open the corresponding report and invoke the Share > Edit Shared Details. 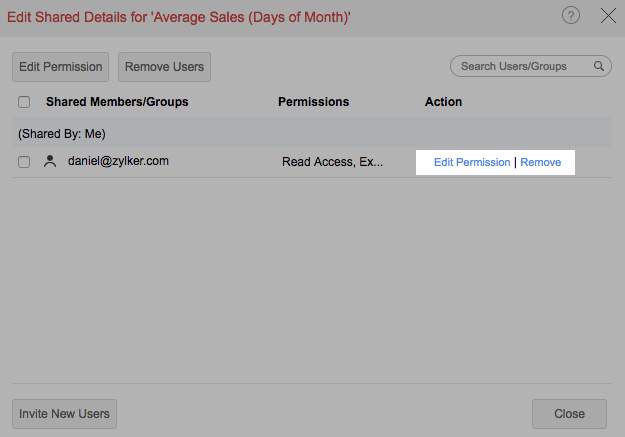 Click the Edit Permission link next to the Member/group name to edit the permissions. Click the Edit Permission link next to private link to edit the permissions. 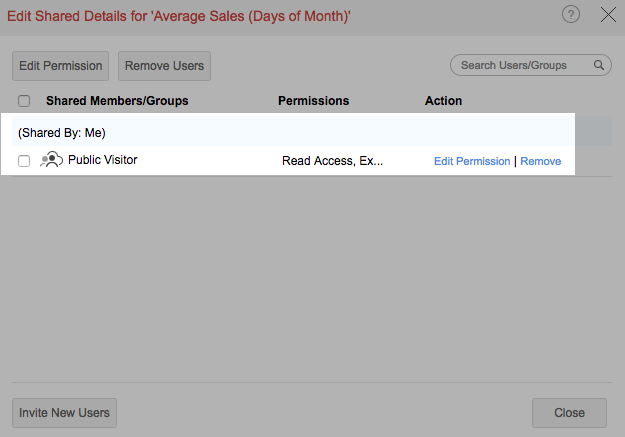 Click the Edit Permission link next to public visitor to edit the permissions. 12. How do I remove the access of the URL? Click Remove to remove the permission. 13. Can I pass a dynamic filter for the view? Zoho Analytics allows you to apply dynamic filters to your views when sharing it to your users. Using this feature, you can share the same permalink to different set of users by applying different set of filter criteria, to suit the allowed permission, context and profile of the user who is accessing the URL. Filters can be applied by passing the required filter criteria to the parameter named ZOHO_CRITERIA and appending it as a part of the URL/Permalink. The view's data is filtered and displayed based on the criteria specified, whenever a user access the link. he above URL displays Store Sales bar chart when accessed by the users. To limit the view to just show the Store Sales for the year 2016, add ?ZOHO_CRITERIA=year("Date")='2016' to the URL as shown below. Here in the example Year function is used to extract year from the column Date. You can combine any number of criteria defined in the above-specified format using Logical Operators like AND and OR to form complex criteria, the same way as in SQL SELECT WHERE clause. Also, use Braces '()' to group the criteria for ordering.